Although Lance once became a hi-level house curator with Albion Gallery in London, his unshakeable support of artist organized art, as a category, is key to his own unique vision. With the encouragement of video / Fluxus artist Nam June Paik, Lance Fung left the directorship of the Holly Solomon Gallery in 1996 to open his own gallery. 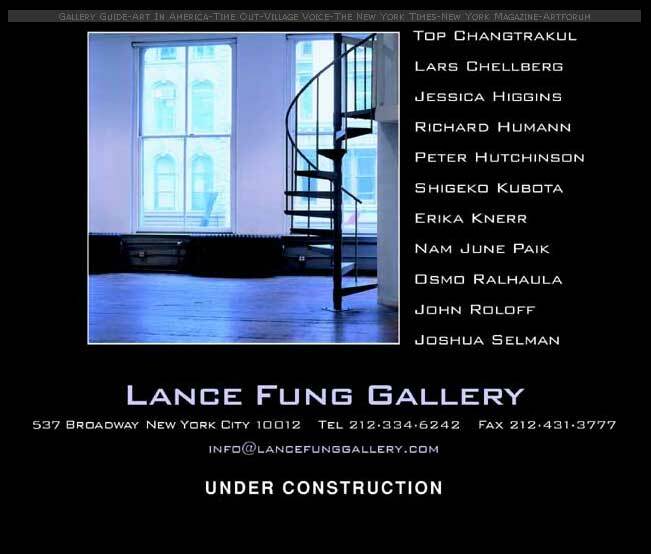 The Lance Fung Gallery became a leading contemporary gallery in New York, working with many of the pioneering artists from the Fluxus, Minimal, and Conceptual periods including Nam June Paik, Sol LeWitt, and Robert Barry. Other artists such as Shigeko Kubota, Peter Hutchinson, and Robert Morris joined his unique gallery focusing on installation and the avant–garde. As an independent curator, Fung has created important a number of exhibitions in this country and abroad: Crossing Parallels, at the SSamzie Space in Seoul, Korea; Going Home, at the Edward Hopper Historical Museum in Nyack, New York; Revisiting Gordon Matta-Clark, at the Venice Architectural Biennale in 2002; and The Snow Show Preview at UNESCO’s Palazzo Zorzi for the 2003 Venice Biennale. 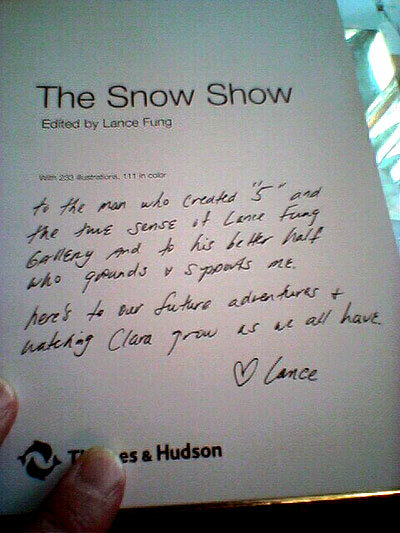 THE SNOW SHOW / Edited by Lance Fung.–New York, NY: Thames & Hudson, dist. by W. W. Norton, May 2005.–208 p.: ill.–ISBN 0-500-23819-7: $31.96. Curator Fung was inspired by Robert Barry, a founder of the conceptual art movement and Lance Fung’s trip to Scandinavia , during which he had a conversation with a friend, curator Marja Bloe at the Stedelijk Museum. Bloe suggested that Lance Fung explore the relationship between installation artists and master architects, as the idea took shape Fung researched the relationship and found that with the exception of museum building projects, they had little creative interaction. According to Lance Fung he “…searched for similarities in purpose, aesthetic and philosophy, which would allow for additional surprises and links within the partnerships.” Additionally, through his selection of participants, he intended to “…show the full range of current theoretical thought in the fields of both contemporary art and architecture. “The team composition was as follows (artist followed by architect or architectural team): CarstenHőller / Williams and Tsien; Osmo Rauhala / Asymptote; Eva Rothschild / Anamorphosis; Rachel Whiteread /Juhani Pallasmaa; Robert Barry / Hollmén-Reuter-Sandman; Top Changtrakul / LOT-EK; Ernesto Neto / OceanNorth; Lawrence Weiner / Enrique Norten; Cai Guo-Quiang / Zaha Hadid; Jene Highstein / Steven Holl;Tatsupo Miyajima / Tadeo Ando; Yoko Ono / Arata Isozaki; Do-Hu-Suh / Morphosis; Lothar Hempel / StudioGranda; Anish Kapoor / Future Systems; John Roloff and Diller + Scofidio; and Kiki Smith / Lebbeus Woods. The teams worked in compacted snow, cast ice, harvested ice, and experimental processes, with the following parameters: a maximum footprint of 1,000 square feet, a ceiling height not to exceed 30 feet, and a material composition of at least 80% snow and/or ice. Although each participant was a master in his or her creative arena, all were inspired by the challenge of working with unfamiliar materials. The exhibition, in some form or variation, will take place in the winter of 2006 in conjunction with theXX Winter Olympic Games in Torino, Italy. The book, beautifully designed, gives a sense of the breathtaking installations. Recommended for contemporary art collections in public, academic, and museum libraries.